A brief history of guinea pigs with some fun facts. guinea pigs - how we got our squeek! Guinea pigs originate from South America in the Andean region (known today as Colombia, Ecuador, Peru, and Bolivia). Although fully domesticated now, they were often found living in rocky areas and grassy plains. Like guinea pigs of today, wild guinea pigs were social, living in small groups with one boar (male) and several sows (females) along with any pups (babies). While they would not build their own nest or burrow, they were often found sheltering in burrows created by other animals or natural crevices and tunnels in the landscape. It is believed that guinea pigs were first domesticated as long ago as 5000 BC and were initially kept as a food source (to eat!). This is in fact still common today, in Peru and Bolivia it is not unusual to find guinea pig on the menu. That said, not everyone in South America regarded guinea pigs as just a tasty meal. On the contrary, the Moche civilization actually worshipped them and often included them in their artwork. Fine examples of this, including statues of guinea pigs, have been found in archaeological digs and have been discovered to date back as far as 500BC. Guinea pigs were also known to be used in healing rituals for their ability to collect evil spirits. Incredibly, where Western medicine has not become readily available, this is still being done today! In South America, folk doctors known as 'Curanderos' used guinea pigs during traditional healing rituals to diagnose patients medical problems. By rubbing a guinea pig against a patient's body, a squeal could indicate a point of trauma. Black guinea pigs were regarded as particularly holy as they were the rarest colour to be found in the wild. For the people of the Andies, guinea pigs have lived alongside humans for thousands of years and become steeped in their culture. While they may have been kept as livestock, it was not unusual to find piggies running freely around the household kitchen, feeding off scraps and entertaining the children. Guinea pigs were rarely bought or sold, it was more common for them to be passed on as a present, typically gifted at a wedding or given to a special visitor or child. In the 1530s, the Andean region was discovered by the Spanish. 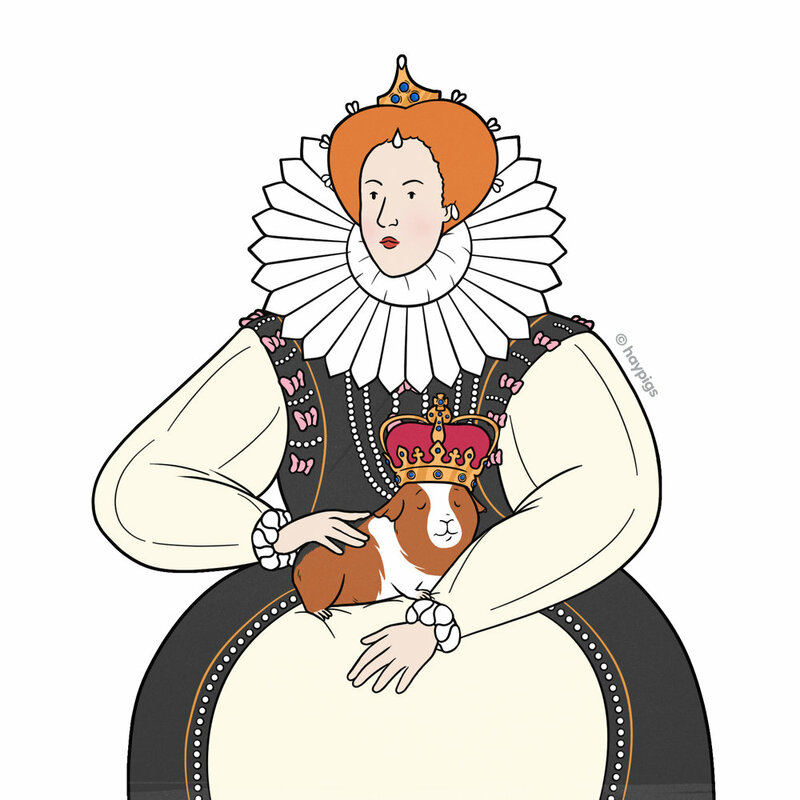 Before too long, Spanish, Dutch and English traders brought guinea pigs to Europe by ship and sold them as exotic pets to the upper class and royalty. In England, one such early adopter was Queen Elizabeth I (no less!) who kept a piggy as a pet. This will have no doubt rocketed interest in guinea pigs and made them somewhat of a status symbol! Today guinea pigs are as popular a pet as ever with over 700,000 in the UK alone. They have been bred into a variety of types and in a multitude of colour combinations. There are guinea pigs with short hair, long hair, wiry and fluffy hair, there are even guinea pigs with no hair! All a far cry from their great ancestors, the native wild guinea pigs of South America!